What is your concept of Judgment, do you think about like the Old West concept you know the old hanging Judge, like a Judge Roy Bean, you know that he, what was it, the Jersey Lilly his salon there that opened doubled as a court room, with a sign up there Judge Roy Bean, Wild West of the pay coats and you know this is the one concept of Judgment and Justice, you've got the hanging Judge there. 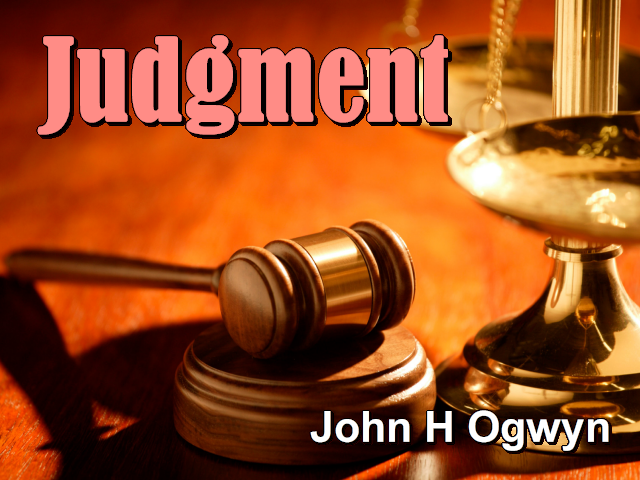 What kind of concept do you have of Judgment? Some people think in religious terms and the expression the Judgment Day is enough to sum it up terrible, boy that's terrible, the Judgment Day and they have the vision of this Being sitting there on this huge chair, a huge throne and He sits there in this interminable line of people is coming up and He looks at one and ok you go to heaven and you go to hell and you go to hell, you go to heaven, you go to heaven.